Roman Quinn, Andrew Knapp, and Dylan Cozens – a trio of former second-round picks – are among the many talented, homegrown prospects rising through the Phillies minor league system. CLEARWATER, Fla. – Because the most loyal and passionate of Phillies fans are a pretty smart bunch of people, you cannot say that the four fields that sit behind Spectrum Field and the activity around them at the Carpenter Complex are the best kept secret of Spring Training. The four sets of bleachers behind the chain-linked fences around the fields are regularly crowded with red-clad fans. Some even bring their own notebooks and cameras to document the action and keep tabs on the future Phillies for their own websites. It’s big business, even. Baseball America has spent the last four decades publishing news from every level of the game, but has been widely regarded as the leading resource for prospects, highlighted by their annual Top 100 list. Since such lists are fun, and the Phillies minor league system is booming with talent as they enter the third season of the organization’s rebuild, what better way to keep up with the progress of prospects on the farm than with our own, regular rankings? Most of the names on this list won’t be too much different than the ones you’ve seen at Baseball America, MLBPipeline.com, Baseball Prospectus, ESPN.com, and others. But as with all of those individual lists, the order might be a little different. Hey, we’ve had a whole spring training to watch these players and talk to folks around camp. But this isn’t a one-and-done prospect ranking, either. We’ll keep it fresh and keep you updated throughout the spring and summer by updating the list regularly, as many sports websites do with teams throughout a season. Players will shift up and down, some will depart and others will enter. The PhillyVoice Phillies prospect power rankings, if you will. A little wordy, sure. But fun, right? As with most prospect rankings, players are only eligible if they haven’t graduated to the major leagues (and we’re not counting September call-ups as "graduating" since it’s a common thing for top minor league talent to get a taste of big league life only because rosters have expanded). So here we go, the inaugural PhillyVoice Phillies prospect power rankings. (Look for the second edition next month, after the minor league season has started). Crawford has held the top spot on nearly every Phillies' list almost since he was drafted in 2013. He struggled toward the end of the 2016 season at Triple-A, but his glove at shortstop and plate discipline will bring him to the big leagues sooner rather than later. Joe Jordan, Phillies Player Development Director: "I think he’s ready. I think it’s going to happen. This is the year. J.P. doesn’t carry the burden of being 'the guy.' I don’t think that bothers him at all. Beyond all of the stuff that we know – good defensive player, on-base percentage – he’s going to be a good major league hitter. This guy’s bat is going to play in the big leagues. But he’s got all of the leadership stuff. He wants to win as much as any player down there. He’s a great teammate – not just a good teammate – a great teammate." Alfaro was the gem of the Cole Hamels' trade and has very loud tools in his plus-arm and power bat. Needs to improve consistency as a game caller and discipline at the plate. How does he take the next step? The No.1 overall pick from June's draft is known for his advanced bat and athleticism in center field and on the basepaths. He'll be tested often in the rigors of his first full season in pro ball. 2016 stats: .287/.361/.441, 6 HR, 6 3B, 14 2B, 31 SB in 71 games at Double-A; .263/.373/.333 4 2B, 5 SB in 15 G with Phillies. Quinn put his impressive skills on display for a two-week period in Philadelphia in September. He's battled injuries throughout his pro career. What’s he need to do in 2017? 2016 stats: 5-0, 0.67 ERA, 0.759 WHIP, 44 K, 8 BB in 54 innings/11 starts. Sanchez was just 17-years-old when he began dominating the opposition in the Gulf Coast League last summer. His numbers were eye-popping. The 6-foot Dominican led GCL starters in ERA and WHIP. Like Alfaro, Williams arrived in the Hamels' trade but was closer to the big leagues after a very productive 2015 in Double-A. But when things went bad in 2016 at Triple-A, they snowballed. Williams seemed more confident in big league camp this month. How does he get to Citizens Bank Park? The stat line is a bit misleading: Kilome had a 2.73 ERA after his first three games (a 20-start stretch). And he got even better as the season progressed: Kilome struck out more than a third of the hitters he faced in his last 10 starts (71 of 210, while walking only 16 in 53 1/3 innings) and sported a 2.10 ERA, too. The Phillies were excited with Cozens' power potential the day they drafted him in June of 2012 and he realized that power by hitting more home runs than any other player in affiliated minor league baseball in 2016. Older, wiser pitchers will test him early and often with off-speed stuff in 2017. 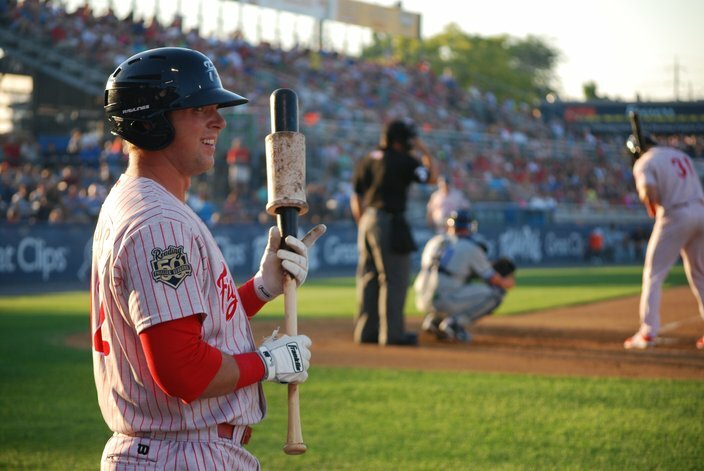 Rhys Hoskins, waiting on deck while Dylan Cozens hits, hit 38 home runs at Double-A Reading, which was the franchise record entering 2016. Cozens hit 40 home runs this year. Full disclosure: if this list was simply based on hitting and hitting alone, Hoskins would be ahead of his former Reading bash brother Cozens. Hoskins has a .372 OBP in three minor league seasons since being drafted out of Cal State-Sacramento in the fifth round of the 2014 draft. Defense could stand to improve. Perhaps the forgotten man in the farm system with the arrival of Moniak and others in last year's draft, along with the development of the outfielders in the upper levels of the farm system. Randolph, the 10th overall pick in the 2015 draft, missed more than two months of the 2016 season with a shoulder injury. The Phillies balanced the selection of Randolph, who they considered the top prep bat in the draft, by taking Kingery in the second round out of the University of Arizona in the second round of 2015. He impressed in big league camp with a quick swing, strong defensive skills, and foot speed that probably ranks behind only Quinn and Cesar Hernandez. Could climb this list quickly. Perhaps there are arms with a higher ceiling in the Phillies system, but Pivetta earns a spot on the inaugural list because he handled himself with a veteran poise in three appearances with the Phils this spring. He looked ready and able. Granted it was all of eight innings, but there's something to be said for an upper-level arm that has success at two different stops in one season as a 23-year-old. Three who just missed: RHP Drew Anderson, 2B Daniel Brito, RHP Adonis Medina. Next up: Former second-round pick Andrew Knapp is the favorite for the Phillies Opening Day back-up catching job. Sleeper: RHP Shane Watson. The former first-round pick (and J.P. Crawford’s former high school teammate) was healthy again last summer and has been sitting in the mid-90s in minor league camp. Like the new PhillyVoice Sports on Facebook.